This simple kraft paper tube packaging box is used to contain T-shirt or other clothes like socks or short trousers. It is now a trend that people prefer compact, easy-to-carry packages for daily used things especially when they are in a travel, that is why convenient products like compact T-shirt or towels are so popular. For such convenient and compact products, using such an attractive kraft paper tube box for packaging is without doubt a great idea. 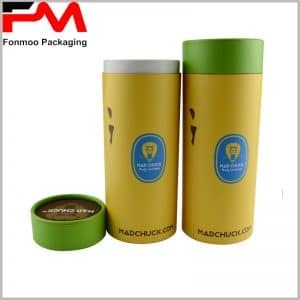 First of all, the cylindrical structure is by nature a good protection and accommodates with human’s view of beauty; second, this kind of tube box is very easy to carry; third, it can be re-used as containing box for other things as to protect the environment. For this purpose, this box is made of gray tube cardboard and eco-friendly 157g art paper, as to ensure our responsibility for the nature and to provide the best attraction. In terms of dimensions, its height is 20 cm and diameter is 8 cm, but you can also demand to make any size you need. 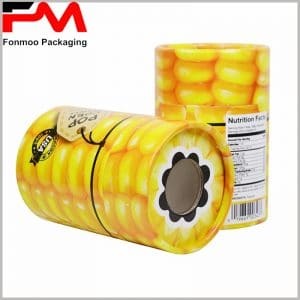 Our professional team has worked in packaging solution for years, and as a manufacturer, we can guarantee you the best price without any intermediary. Just tell us what you need and we will provide you the best kraft paper tube packaging box for T-shirt or other clothes.